When considering this passage, Martin Luther, the great reformer, said that darkness here refers to evil, unrighteousness, false notions about God’s Law, errors rooted in relying on human wisdom rather than God’s wisdom, and religion that wrongly believed that we can be saved by being good or doing good. By that measure, the world is still a dark place. There are still people who ignore God’s command that we love Him and our neighbor and instead, treat others with disrespect or violence...still people who don’t understand that we are saved from sin, death, and pointless living only by faith in the Child Whose birth we celebrate tonight...still people who live in the darkness of unbelief because Christians have not obeyed the risen Jesus’ great commission to make disciples. But Isaiah prophesied exactly what has happened through Jesus. Though we live in a world covered in darkness, we have seen a great light, the light of God has dawned on this world, bringing a new day. Luther says that the light Isaiah is talking about here is two things. God has pierced our darkness with His Son and offered life to all who will surrender to Him. Jesus comes to us as the Light of the world. In Him, we can see God clearly despite the darkness that so often engulfs our souls and this world. In Him, we can see our sin and God’s willingness to forgive the repentant. In Him, we see that God is good and loving, that He wants to be reconciled with us for all eternity in spite of our sin. For some, the offer of the Gospel isn’t enough to incite surrender to God or belief in Christ. They rebel at the thought of a life with God under Christ’s lordship. In fact, that’s the inborn inclination of everyone here tonight, including, I can assure you, me. Like our ancestors, Adam and Eve, we want to “be like God.” But, here’s the deal: When we human beings live out our desire to be like God, we can only plunge ourselves and the world we touch into darkness, absolute, dead, eternal separation from God. And, let's be honest, part of us loves the darkness. I know many people who want enough of Jesus to be saved from death, but not so much of Jesus that they’re forced to make any lifestyle changes. They want to keep most of their lives in darkness, off-limits to Jesus and His Lordship. If you’re doing that, please take it from someone who's been there, know that, no matter how well you may be fooling yourself, you’re not fooling the risen and living Jesus one bit! Jesus, the true Light of Christmas, is the Gospel, the good news of new life for all who turn from darkness and entrust their lives to Him. The second thing that the light in our passage from Isaiah is, Luther says: the Holy Spirit. The news from throughout our world this past week has been dark: the unchallenged Russian/Syrian slaughter of civilians has brought about the devastation of Aleppo; an ISIS-related terrorist drove a truck into a Christmas market in Berlin, killing twelve and injuring 48; the Russian ambassador to Turkey was gunned down at an art exhibit. Absent the power of the Holy Spirit working in the lives of believers, Christians would seem foolish for trusting that Christ will have the final say about this world, that evil will one day be destroyed, that death will be swallowed up by God. But let me tell you something: We are not foolish for trusting in Christ! Hundreds of Jesus' first followers--disciples--risked their lives, with nothing to be gained in this world, to tell the world the truth that Jesus rose from death, conquering sin and death. Today, the Holy Spirit, Who comes to us in our Baptism and reminds us through the Word of God, the sacraments, the fellowship of the Church, and the stubborn commitment of Christians to love and care for their neighbor in spite of everything, the Holy Spirit assures us, reminds us, and connects us to God so that we can believe, we can know, that Jesus has conquered sin, death, disease, and human savagery. There’s a lot of unbiblical nonsense associated with Christmas. There's also much romanticization of the baby Jesus. Look, babies are wonderful. Their lives are precious. Every human being is sacred in the eyes of God and should be in the eyes of the world. Of all the things Christmas is, cute isn't one of them! Christmas, in fact, was God’s D-Day assault on this sin-imprisoned universe. Just as Europe in the 30s to mid-1940s was imprisoned by evil, so this entire world in which we live is imprisoned by the darkness of the devil and our own sinfulness. 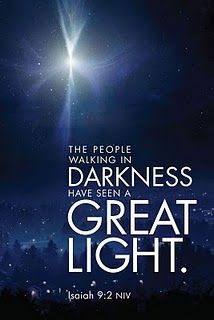 Christmas was God’s light piercing our darkness! The baby Jesus grew to be a Man--true God and true Man--Who would face down temptation and sin to fight for the eternal lives of every person in this sanctuary, every person who has ever lived on this planet, to fight for you, so that by His death and resurrection, He could usher all who believe in Him into the pure, dazzling daylight of God and His everlasting kingdom! Despite the obstacles presented by this world--a census, Roman rule, a jealous Jewish king and selfish religious authorities--Jesus was, miraculously, born in Bethlehem. I can imagine the devil writhing in agony on the night of the birth. Even though He would fight Jesus all through His earthly life and fights Jesus and His people to this day, the devil had to know on the first Christmas, just as perceptive Germans knew on D-Day, 1944, that the jig was up. This baby was God’s foothold in this world, God's beachhead among a people He intended to save. Christmas was the beginning of a war which God would go on to win on Good Friday and Easter Sunday. The Light of the world has come to us through the Gospel--the good news of everlasting life with God for all who believe in Jesus--and the witness of the Holy Spirit. That leaves us with the most important question of Christmas. This is the question with which Christmas presents us: “Do I prefer the darkness of the light? Will I welcome Him as my God and King or live in darkness?" Each day, choose the Light. That’s the Christmas gift God wants to give you today and always. Take it; it’s free. You won’t regret it. Lord, this night as we celebrate Your entrance into this world, we remember that while on earth, You were impoverished and that in the first few years of your life, you were a refugee from a land ruled by despotism, homeless. Fill us with compassion for those who face similar circumstances today, whether they are the homeless served by the Interfaith Hospitality Network and Saint Vincent’s Gateway Center here in our communities or the refugees running from Russian and Syrian government attacks in Syria. Grant that there will always be room in our hearts and lives for those who have need, for, as You have told us, when we serve those the world deems to be the least, we truly serve You. Lord, in Your mercy, hear our prayer. The Interfaith Hospitality Network and the Saint Vincent's Gateway Shelters are two ministries to the homeless in which our congregation is involved. Please remember the poor, the homeless, and the refugees this Christmas...and every day. When encountering God's law as embodied in the Ten Commandments, ask God how we have failed to be obedient. When encountering God's grace as ultimately revealed in Christ, ask God to help us believe that Christ's death and resurrection were for us too. The first question is a hedge against self-righteousness that would destroy our relationship with God and others, driving us instead to repent and be reconciled with God. The second is a hedge against against despair, helping us to remember that we are also part of that world for whom God the Father sent His Son and for Whom the Son Jesus died and rose. His grace incites us to fall into the eternal arms of the God Who loves us with an unquenchable passion. The upcoming Christmas season, which begins in two days, is a great time to get to know God through the reading of His Word. But one other hint: Reading the Bible is best done in association with a group of friends who read the same passages each day, then gather once a week to reflect on the Scriptures, learn from each other's insights, pray together, share their highs and lows, especially in light of what God is teaching them through His Word, and, of course, be a part of a local church family. We were made for fellowship with God and others. By that he meant that Gertie’s long life, though not always easy, wasn’t marked by much in the way of tragedy. Born and raised in Jackson County, she and her husband Frank came to Columbus in search of greater opportunity for themselves and, eventually, for their sons, Jan and Eric, on the west side. They raised their children. Gertie doted on her grandchildren and loved her great-grandchildren. I understand what Eric meant by saying Gertie’s life was remarkable for being unremarkable. And that’s true in this world. But in judging things from the perspective of this world, we display a lower standard for our lives than God has for us. The book of Genesis tells us that we were “made in the image of God” and in Ecclesiastes, we’re told that God has set eternity in human hearts. God built us not for death, but for eternity. With Adam’s and Eve’s fall though, we have become inheritors of things like aging and disease and death, along with an inclination to rebel against God just as Adam and Eve did. We’ve become accustomed to death. And that’s why the psalm tells us that the death of one of His servants is precious to God. And Gertie was a servant of God. Her servant heart could be seen in the three most important realms of her life: her church (the same church in which Eric and I were confirmed together), her family, and the west side. My personal recollection of her is that she never, in a phrase I learned from my Jackson County mother-in-law, “put on the dog.” Over the years, my mother has remarked more than once that Gertie was one of the few women in the Westgate Elementary PTA who didn’t spend most of the meeting time bragging on her kids. Now, I’m sure that Jan and Eric did many things that she could have bragged about. But bragging isn’t what servants of God do. They let their serving and their lives of steady commitment to God and to the important things in life do their talking for them. Like the apostle Paul in the New Testament, a servant’s attitude is “If I must boast, I will boast of the things that show my weakness,” because it’s in the recognition of our weaknesses and vulnerability that we become more dependent on God and His power will shine through lives of service and love and good humor. I know that in making these observations about Gertie, I’m preaching to the choir, so to speak. The people here at the apartment complex knew what kind of person she was. Her family also know what kinds of people you have been for her: warm, caring, considerate friends with servant hearts. The community you share, in fact, may be remarkable because it’s so unremarkable. No great drama. Just aging children of God living in the kind of fellowship, community, and mutual encouragement and support for which God made each and every one of us. You have been Gertie’s cheerleaders and God wants us all to be cheerleaders to each other. You’ve exhibited the confidence in God’s grace and goodness that makes it possible to live life as the apostle Paul said believers should live. “Do nothing out of selfish ambition or vain conceit,” he writes. “Rather, in humility value others above yourselves…” Your love for Gertie has been a witness to her family! A few moments ago, I said that we’ve grown too accustomed to death. That’s true in one way. But in another way, it’s not. If we were as accustomed to death as we often seem to be, family and friends wouldn’t grieve over the loss of a mother, mother-in-law, grandmother, great-grandmother, friend. You will miss this woman who has been such a remarkable (and long-time) presence in your lives. It would be unnatural for you not to grieve! The good fight to which Christ calls us, the good fight I believe that Gertie fought each day, was the fight to hold onto Christ. To trust in Jesus, to believe in Him. To those willing to trust in Him, Jesus gives the power to believe, the power to hold on, the ability to be servants of God who don’t need to “put on the dog” because God has already proven their value on Christ’s cross, and the privilege of living with God forever. Hold onto Christ today and always. He will be your comfort, your strength. He will dry your tears. For this morning's Quiet Time, I considered Revelation 17. Despite its strange apocalyptic language and imagery, this chapter may be the simplest in Revelation. John writes about a vision he has of "Babylon," symbolizing ancient Rome and its empire in which he lived. Revelation 17:9 says: "The seven heads are seven hills on which the woman sits." Rome was known as the city of the seven hills. It was from there that the empire--the prostitute in Revelation 17--ruled. The Roman rulers hated the most basic Christian confession--"Jesus is Lord" because they deemed themselves lords, even imbued with deity. And so, for that and other reasons, Rome persecuted the Church. In Revelation 17, John is assured by the angel, explaining his vision that Rome's reign of terror would not last indefinitely. There will be a reckoning for all governments and people who sin unrepentantly, act unjustly or inhumanely, exhibit a callous disregard for God or people. Rome would fall in time or at the judgment, he could be sure. "Stick with Christ in the face of persecution and adversity," is the message of Revelation 17. Christ has already defeated sin and death and on the day of Christ's return to this world, all will be made right. That's a good word for all who trust in Christ. In its way, it echoes Paul's words in Romans 8:38-39: "...neither death nor life, neither angels nor demons, neither the present nor the future, nor any powers, neither height nor depth, nor anything else in all creation, will be able to separate us from the love of God that is in Christ Jesus our Lord." Evil may have its day. "Hordes of devils may fill the land, all threatening to devour us," as Luther puts it in A Mighty Fortress is Our God, but Christ has triumphed over the darkness, the evil, the devil, the suffering, and the sin set loose in this universe. And He gives a share of His triumph, achieved on the cross and from the empty tomb to all who follow Him. Now seems like a good time to say, "Amen!" The Holy Spirit calls the Church into being so that people can, in fellowship with others, know Christ personally, know that by faith in Him, have life with God now and for eternity, and experience walking with Christ in a relationship through which we mature increasingly in our faith and lives. The Church is a gift of grace to sinners like me. As part of Christ's Church, my life has been enriched, my foibles challenged, my wrongs forgiven, and my character forged in ways that never would have happened outside of the Church. As time goes on, I am more and more grateful for the Church and for all the people in it. The true Church, the fellowship of Christ-Followers, is the only thing on earth that will survive in eternity because, no matter how many ways we human beings try to mess it up or force it to agree with our sin-tinged preferences, it's still the creation of the Holy Spirit, still freed and disciplined by God's Word. The institutional church, the church of human regulations and power plays, will, of course, die with the rest of this universe one day. But the fellowship of surrendered souls, who trust in the Lordship of the crucified and risen Christ and in the infallibility of God's Word in Scripture, who cherish God's gift of grace in Christ...that Church will move into eternity with God, where every disciple of Jesus will be welcomed with the words we should all crave to hear more than any others: "Well done, good and faithful servant." And even that "well done" will not be a recognition of our accomplishments, but of the saving work done by Jesus and of the faith-creation of the Holy Spirit within people willing to believe in Christ. In fact, all we need to be part of the eternal Church is a willingness to believe in Jesus. It's like the man who asked Jesus to heal his child, if Jesus could. Jesus asked the man, basically, "What do you mean, IF? Just believe." The man honestly told Jesus, "I do believe; help my unbelief." With that expression of a willingness to believe, Jesus honored the man's prayer request. Jesus didn't chastise the man's unbelief. He took the desire to believe and, by His grace, turned it into saving faith! But if you're willing to believe in Jesus, I warn you...watch out! Slowly, the Holy Spirit began to pry me open. Over time, the class became less like an anthropology project in which I tried to understand people from a strange culture and more of an introduction to a Person I had never previously known, not really. That person was Jesus Christ. As I read passages from the Gospels (Matthew, Mark, Luke, and John, found in the New Testament portion of the Bible), which tell about the life, death, and resurrection of Jesus, I found myself increasingly pulled to this man the Christians say is also God, Whose death on the cross paid the price for my sins and Whose resurrection opened up an eternal relationship with God for anyone honest enough to own their sins and turn from them (what the Bible calls repentance) and hungry enough for relationship with God to entrust their whole lives to Jesus (what the Bible calls "believing in Jesus"). 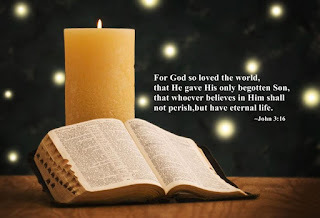 Jesus put it all succinctly in the Bible's most famous verse, John 3:16: "For God so loved the world that he gave his one and only Son, that whoever believes in him shall not perish but have eternal life." Eventually, I began to do something that I'd never before thought to be meaningful; I prayed. I didn't know exactly how to talk with God, but I told Him that, while I found it hard to comprehend, my masculine penchant for self-reliance and my intellectual desire to be in control and have all my questions answered were evaporating and Jesus, selfless, loving, courageous, powerful, humble, was pulling me into His orbit. I told God that I was willing to believe. That, I think, is when the Holy Spirit really rolled up His sleeves to pull me out of the death and darkness that every human being endures apart from a saving faith in Jesus. The Word of God on the pages of Scripture came to life for me as they never had before. And God arranged for a woman forty years my senior, Martha, a member of the Lutheran Church my wife had "guilted" me into attending, to take me under her wing and teach me what it means to follow Jesus. She taught me how to read God's Word and how to pray. She taught me about the grace that could take a sinner like me and add another descriptor to my life, saint...not meaning perfect, but saved, and, like all the other saints and sinners who make up Christ's Church, saved from sin, death, darkness, and themselves, and grateful for the forgiveness and new life God gives them even though they don't deserve any of it, seeking always to live out the love of God and love for others that God. Through Christ's Church, the Holy Spirit helped me to believe. Now, when my fellow believers and I confess the Christian faith on Sunday mornings, as we always do, I confess my faith in God the Father, Son, and Holy Spirit loudly, with zest and true conviction! I'm grateful that through faith in Jesus Christ, God is saving me from sin, death, and darkness! The Church's faith (my faith) in Christ is the work of the Holy Spirit. And it's a work He wants to do in every human being. You don't have to manufacture your faith. Or talk yourself into it. Or check your brain in at the church door. Just be willing to believe in Christ and the Holy Spirit will begin constructing a life of faith within you! No matter what your skepticism...or sins you fear are too big for God to forgive...or whatever imperfections you perceive in yourself, if you will connect with a local church where they confess and share Jesus in a loving, honest, Biblical way, the Holy Spirit can meet you and help you to live with the assurance, peace, hope, and BELIEF that belongs to all who, in the Spirit's power, can say, "Jesus is Lord! He's my Lord! I follow Him and Him alone!" This week, for Christmas Eve and Christmas, why not worship with a church family near you? Christmas is a wonderful time for those who are willing to trust in Jesus to get to know Him and His family, the Church. Here are my reflections on Revelation 16 from this morning's Quiet Time with God. The people who have spurned God are cursing God because they’re experiencing the wrath their faithlessness has brought into their lives. Wrath is the consequence of a life turned away from God. It’s like the electricity that can come through a wall receptacle. It will in no way hurt you. But if you poke your finger into one of the holes or stick a piece of metal into one of them, the electricity conducted to your body will hurt you. Wrath is the consequence of breaching the boundaries of the good life--the shalom life of peace, of love for God and for neighbor--that God has in mind for us. We incur the wrath of God, eventually if not immediately, whenever we step outside the bounds of the good life. That is, whenever we sin. The recognition of God’s disapproval of sin--whenever we see that our behaviors violate the law of God as expressed in the Ten Commandments, should bring us to repentance. Repentance is more that being sorry for our sin. It’s more too than asking for forgiveness in Jesus’ name. It’s characterized by the joyful recognition that because of God’s great grace--literally, God’s charity toward us--I’m not just forgiven. I’m also God’s friend. God and I are one. Listen: In the passages from Revelation 16, the people experiencing the wrath of God are so certain that they have a right to live like gods, deciding what’s right and wrong for themselves with no consideration of the will of God, that they’re incensed at what they see as God’s effrontery in letting them experience the consequence of turning from Him. They’re offended that God would be upset or offended by their rebellion against His will that we obey the Ten Commandments, that we love God and love neighbor, and trust in Jesus for our lives. “Who is God to rain on my parade?” they think. And so, they refuse to repent. They refuse to honor Him as God. They even curse God. I know that in my own subtle ways*, I too have blamed God for the protective walls of wrath He has sometimes erected to protect me from my bad behavior and my bad judgments, to cause me to “come to my senses” (Luke 15:17), to repent and be reconciled to Him. These are times when I have--and I feel stupid that it’s something I must confess to be true--refused His grace and, instead, incurred the wrath of God by insisting on getting my own way. How dumb is that? When I consider Your grace, Lord, I’m filled with sorrow for disappointing You and harming Your gracious plan for shalom by my insistence on being my own god. Lord, please forgive me. Respond: Forgive me for blaming You, Lord, when things don’t go my way when often “my way” has nothing to do with Your way for human beings to live. When You confront me with my sins, help not to make excuses or rationalizations. Help me to repent. Help me to return to You, be embraced by Your grace, my life built once more on You and not on the shaky ground of my faulty judgment. In Jesus’ name. It’s not a new observation to say that the beginnings of things often explain a lot about their later development. How a thing is begun is that important. Our Gospel lesson for today gives us Matthew the Evangelist’s account of the beginnings of Jesus' time on earth and of the new beginnings God can give everyone through Jesus Christ. Take a look at our lesson for today, Matthew 1:18-25. The English phrase pledged to be married doesn’t do justice to the state of Mary’s relationship with Joseph. They were betrothed. Betrothal in those days was more than an engagement. During betrothal, the couple were considered married, although they were strictly forbidden from consummating their relationship until they publicly affirmed their commitment to one another before God and witnesses. If one of them had intimacy with someone else during betrothal, that act was considered adultery. The Old Testament book of Deuteronomy said that if a woman was guilty of adultery during this period, she should be stoned to death. By the first century AD, this law was rarely enforced. But even then, the woman divorced by her betrothed, however quietly it was done, didn’t have an easy lot in life, forever branded by her adultery. Our lesson though conveys an unambiguous message: Despite, Joseph’s suspicions, Mary was a virgin. She and Joseph had not, we're told, come together. And, the child conceived within her was from the Holy Spirit. Later in the passage, we’re told that Mary and Joseph didn’t have marital relations until after Jesus was born. Still, some virgin birth deniers point out that other ancient religions told stories of their idols roaming the earth and having intimate relations with women, often resulting in the birth of notable persons, like the fictional Hercules. They say that the claim that Jesus was born of a virgin is similar. But the witness of the New Testament about God the Father and about Jesus’ birth is very different from those mythical gods. During His ministry, Jesus said that “God is spirit” The God of the universe isn’t like the bawdy deities of mythology. He is Spirit, Who by His Word created matter, created human beings. Just as the book of Genesis says that God’s Spirit moved over chaos and brought life into being, so now, as God prepares to gives us the chance for new life through Jesus Christ, His Spirit passes over a virgin’s womb and the Person the apostle Paul calls, “the second Adam,” is conceived. Hurt by a woman he believes has violated God’s will that sexual intimacy be confined to marriages between men and women, Joseph decides he won’t lash out. But he also won’t have a life with a woman he believes has been unfaithful to him. The verb translated as divorce here in the original Greek is apoluo, meaning literally, loosed from. Joseph was going to cut Mary loose. 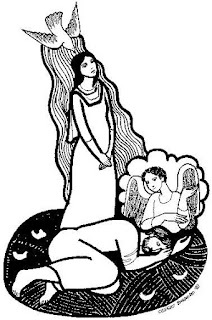 Verse 20: “But after he had considered this, an angel of the Lord appeared to him in a dream and said, ‘Joseph son of David, do not be afraid to take Mary home as your wife, because what is conceived in her is from the Holy Spirit. She [Mary] will give birth to a son, and you are to give him the name Jesus , because he will save his people from their sins.’ All this took place to fulfill what the Lord had said through the prophet [in Isaiah 7:14]: ‘The virgin will be with child and will give birth to a son, and they will call him Immanuel’--which means, ‘God with us.’"
Joseph knew God well enough and knew God’s Word well enough to know that the angel was telling the truth. If we aren’t like Joseph, on intimate terms with God and His Word, we won’t recognize when God is acting in our lives. We won’t be able to resist temptations that when acted on, can drag us down to hell. Like Joseph, we need to know the God we meet in Jesus Christ so well that even when things don’t make sense, we will keep following Him! I hope that every member of Living Water will make it their business to know God through regular Bible reading and study, including such time with fellow disciples of Jesus! Now, in these verses, Matthew mentions two names associated with the Child in Mary’s womb. Matthew does so because in Biblical times, names were very important. For example, the name of Jacob, that notable schemer in the Old Testament, means literally, he grabs the heel, a way of saying supplanter or usurper. If a name ever suited a person, that of Jacob, this man who connived to steal his brother's inheritance, did. But even today, I'm convinced, the names we call people or circumstances have a way of sticking and meaning something. Ann and I have two versions of how we came to name our son, Philip Martin. As I recollect, the name began with me sitting in the library of the seminary where I was a student and thinking, Philip Melancthhon and Martin Luther, the names of the two eminent theologians of the Reformation and colleagues on the faculty of Wittenberg University in Germany. And because Martin was also Ann's maiden name, it seemed perfect. Oddly enough, our son Philip always seemed like a natural born theologian. Even as a young boy, he would ask me the most probing faith questions that I found hard to field. And when he was in college, he was given two different nicknames: Phil the Lutheran and Phil the Philosopher. He has always seemed to be to have lived up to his given names. This past June, when we went to Walburg for his installation as pastor of Saint Peter Lutheran Church, we were given a tour of the church building. The sanctuary had traditional stained glass windows, most of them showing Biblical scenes and events. All but two, that is, because in the front, to the left of the altar, were two windows: one showing Philip Melanchthon and the other showing Martin Luther. Maybe the names we call each other do matter. At the very least, God seems to think so. 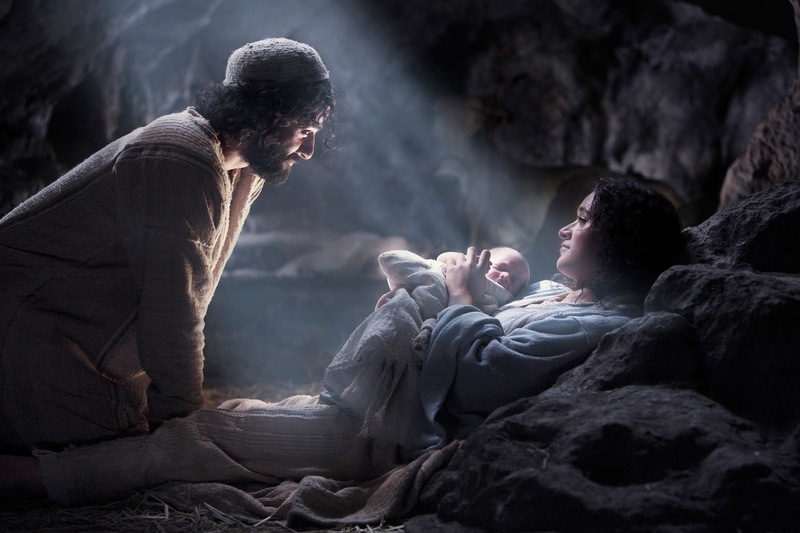 In our lesson, we're told of two names applied to the Messiah conceived in Mary's womb. First: Jesus, the Savior’s given name. It means Yahweh, [God], is our salvation. Jesus’ given name says that God sent Jesus to save His people from sin. “The wages of sin is death,” as we know. But Jesus came to take the wages we deserve--death, condemnation, separation from the God Who gives life. Then He rose from the dead so that all who believe in Him have the gift we don’t deserve: Never-ending life with God. And Jesus came to save more than just God’s first people, the Jews. In the great commission, Jesus sends us to share the Good News of new life for all who repent and believe in Him with people of every nation. Jesus came to give all people the chance to believe in Him and be saved for eternity. That’s why Jesus commissions you and me, as His disciples, to be His ambassadors and to help others know and believe in Him! Jesus came to save all who turn from sin and trust in Him. Second: Matthew also tells us about the name Immanuel. It’s a nickname, really. Like many nicknames, it’s descriptive. As the text says, Immanuel (in all its varied English spellings) means God with us. Jesus is God with us today, now, in this world. In those two names--Jesus and Immanuel--we find everything that makes Christmas worth celebrating! Immanuel, God with us, assures us that no matter what happens to us in this life, God stands by us, strengthening us, encouraging us. Jesus, meaning Yahweh saves, is our salvation, assuring us that no matter how lost we may feel, no matter how guilty, when we trust in Him, we are saved from sin and death and separation from God. We have life with Him now and will have it in perfection in eternity. The hope of heaven that Jesus gives to His disciples imbues this life with joy even when we’re unhappy or guilty, assures us of peace even when things are crazy. That, friends is the good news that came when God was virgin born of Mary and Joseph accepted the responsibility of acting as His father on earth. If we want Him, we are saved and accompanied always by Christ! Welcome Jesus as Mary and Joseph did, ignoring the wagging tongues and the warped reason of a world that wants to sell God short and feed human ego. Welcome Him into the center of your lives. Let Him live with you every day. Because of all the things the God of this universe wants, He wants you most of all! Let that truth soak into your heart and mind this Christmas and every day!